I have not stopped laughing since my another use for Aurifil post yesterday. Thanks for all the great giggles and comments you left. Thanks as well to Annabella, Lynne and particularly Alex Veronelli for spreading the word about threading as well as putting my ugly mug on the Aurifil facebook page!! Hilarious! 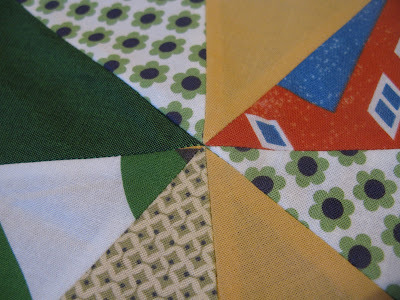 If you want to make these gorgeous blocks please visit the fabulous selfsewn for the tutorial as well as great info on English Paper Piecing. Sweetie it certainly was the most amusing Aurifil post in ages! Loved it. Havent got it to work yet mind you.. will try again tho! Cindy and I were just saying that someone needed to alert Alex.....so happy it has been done! Wonder if Alex will try it out?? If he is at Birmingham perhaps you could use him for your demo!?? Look forward to seeing the finished quilt, it's going to be gorgeous. Hee hee - you are very welcome! I love your new stardom as an Aurifil threader to quilting celebrity and starlets. Your rose block is gorgeous and I shall check out that site as EPP may be my new love. You're hilarious, Lucy! I've missed you in my hiatus from blog reading! I can't believe you have 17 of those rose star blocks.. can't wait to see them all together one day. :) I'm sure your friends will love the quilt.. looking forward to the reveal. Have a great weekend! You had me ROFLOL :) Beautiful Rose block,and those points are Perfect!! Going to check out that link. Love seeing your progress on the Rose Star blocks - great choice of fabrics! How many are you planning to make? Can't wait to see it finish - it'll be stunning for sure! Look forward to seeing the finished baby quilt too! I won't tell you I told you so..." about your infamy on Facebook!!! (oh, I just did!) Love the Rose Stars! But I think you already know this! It was hilarious! I love your Rose Star blocks, I've nearly finished one and it's taken me ages, so hats off to you! I'm just glad there werent photos of you threading your bikini line....! You certainly started something, didn't you? Your block looks great though! I need to keep up better with you, you are too funny! I love your Rose Star blocks, they are sol full of colours. Ha! Look at you on Aurifil FB! That's brilliant! I thought you looked great, no ugly mug to speak of! Your quilt block looks fantastic! I love how the patterned fabrics and colors look pieced together like that. Congratulations to your friend! I am sure the quilt you make will be gorgeous! I keep seeing these Rose Stars all over the place so THANK YOU or posting a link to where I can find the templates!